My son went through a Captain Underpants phase back in grade school. He absolutely loved the books, gobbled them up. For parents, especially of young reluctant, mostly male readers, that’s the good news about “The First Epic Movie’’ as goofy and gross as it may be. 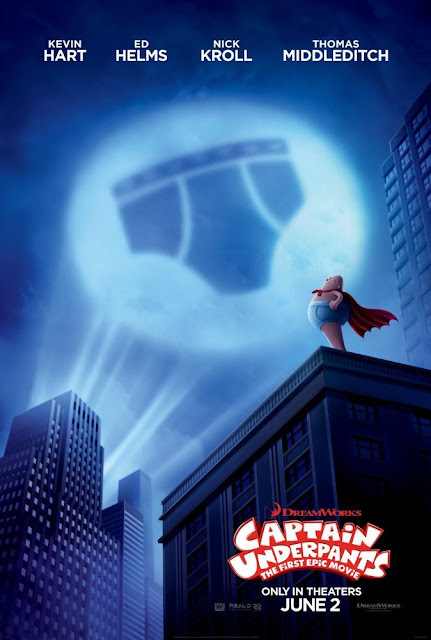 If your child likes the movie, there are plenty of other Captain Underpants books by Dav Pikey for him to gobble up. From there who knows what he might choose to read as well? Harry Potter, of course, but also The Phantom Tollbooth by Norton Juster, Louis Sachar’s Holes, The Chronicles of Narnia, Gary Paulsen’s Hatchet, Jack London’s classic The Call of the Wild, The Outsiders, The Golden Compass Series by Philip Pullman, Lemony Snickett’s Series of Unfortunate Events, A Wrinkle in Time, hundreds, thousands, a lifetime of books to love and learn from. Here's the trailer, the film comes out June 2.